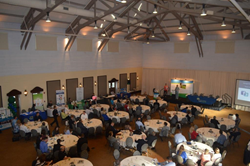 Georgia Partnership for TeleHealth (GPT), a charitable nonprofit promoting the establishment of telemedicine programs in communities throughout Georgia, hosted over 160 attendees from throughout the Southeast during its Seventh Annual Spring Conference, which took place March 2-4, 2016 at the Jekyll Island Club Hotel in Jekyll Island, GA. This year’s speaker presentations can be accessed here. As part of this year’s conference theme, “The Innovation Edge of Everything,” GPT announced the recipients of the Telehealth Corporate Champion of the Year, Telehealth Champion of the Year and Telehealth Coordinator of the Year Awards. Recipients were selected based on their commitment to the growth, innovation and advocacy of telemedicine services. Ethica Health & Retirement Communities received the Telehealth Champion of the Year Award. Ethica Health & Retirement has implemented telehealth services in many Skilled Nursing Facilities (SNFs) across the state which has benefited many of Georgia’s senior citizens. The Telehealth Champion of the Year Award went to Millie Thrift, RN and Coordinator for the Ware County School System in Waycross, GA. Ms. Thrift has launched one of the most successful school-based telehealth programs in the state. Her enthusiasm for delivering the right care at the right time to her students has made her a true champion. Jennifer Murphy of Appling County was the recipient of the Telehealth Coordinator of the Year Award. Ms. Murphy has become the strongest of telehealth advocates and professionals in her county. She is successfully launching & coordinating telehealth services between schools, hospitals and clinics. GPT expects that Appling County’s telehealth program will become a premier model for other county systems to emulate, under her leadership. For more information on GPT, please visit http://www.gatelehealth.org/. The mission of the Global Partnership for TeleHealth is to deliver worldwide access to healthcare. Our unparalleled success in the United States in applying telehealth programs and services has assisted agencies in providing cost effective, efficient, and high quality healthcare. For more information, visit the GPT website at http://www.gatelehealth.org/.